Photovoltaic (PV) Inverter Market size was valued above USD 5 Billion in 2017 with annual installations to exceed 100 GW by 2024. Favourable government initiatives to promote renewable energy along with large scale investments toward sustainable grid integration will propel the global PV inverter market share. Monetary funding and various government schemes including net metering, feed in tariff to promote the establishment of innovative projects and development of advance technologies will further augment the industry growth. In 2017, 75% of global photovoltaic industry was driven by financial incentives, 5% from competitive tenders and 14% through net metering across the globe. Rising off-grid electricity demand favoured by ongoing expansion of microgrid networks will further complement the industry outlook. Declining solar component cost along with increasing operational efficiency has escalated solar installations, which in turn will drive the global photovoltaic inverter market growth. Enhancement of primitive technologies coupled with volume manufacturing practices have resulted into considerable decrease in the overall component prices. In addition, stringent government norms to curb GHG emissions favoured by rising electricity demand will further enhance the industry landscape. Rapid urbanization along with favourable government reforms to reinstitute the dwindling small-scale industries across developing economies will stimulate the single phase PV inverter market. Ongoing integration of renewable energy networks followed by positive regulatory prospects including incentives to sustain their adoption will further propel the industry size. Three-phase units owing to their effective operations across large capacity industrial installations and transmission networks possess major revenue share. In addition, the rising demand for power reliability across industries including mining and oil & gas will further escalate the product demand. ≤ 300 W photovoltaic inverter market share is predicted to witness robust growth on account of their deployment favoured by lowering product costs across small-scale solar PV applications. Improving unit efficiencies along with increasing inclination towards operational flexibility will augment the product demand. Furthermore, the growing demand for cost-efficient and cost-effective PV installations in line with increasing off-grid deployment will complement the business outlook. Utility based deployments coupled with ongoing adoption of PV technology to establish a renewable energy mix across industries will enhance the > 110,000 W photovoltaic inverter market share. In addition, ongoing industrial expansion in line with the adoption of economies of scale implemented by major market participants will considerably thrust the industry potential. ≤ 230 V PV inverter market in 2017 was valued over USD 2 Billion. Rising demand from the downstream sector along with increasing product shipments to China will augment the business landscape. In 2017, The global installed PV capacity reached 100 GW with over 50% of the installations contributed by China. > 600 V photovoltaic inverter market in anticipated to grow subject to their large-scale adoption across industrial establishments coupled with favourable utility aided solar installation facilities. In 2017, MEA region experienced a robust growth on account of Turkey’s contribution toward new PV installations of 2.6 GW. On grid solar photovoltaic inverter market is anticipated to witness a gain over 9% by 2024. Ongoing electrification programs coupled with favourable government initiatives to enhance the deployment of grid connected sustainable electricity infrastructure will further stimulate the business outlook. Increasing deployment of micro-grid networks with rising demand for off grid power from rural areas will enhance stand-alone PV inverter market size. In 2017, the U.S. Trade and Development Agency granted Community Social Enterprises Ltd. to bring out feasibility study for the plan to install 25 off-grid solar PV microgrids in Nigeria. Micro photovoltaic inverter market is set to exceed an annual installation of 1 GW by 2024. In addition, string technology are anticipated to expand on account of its simple design and associated lower maintenance costs. Furthermore, growing installation of commercial and utility scale solar projects will boost the central PV product demand. Residential photovoltaic inverter market is projected to expand at the rate of over 10% by 2024. Electrification program in developing nations focusing on decentralized generation coupled with rapid advancement of distributed generation technologies will favour the global industry outlook. Determined plans to reduce carbon footprints coupled with rising demand for clean and reliable power will sway utility deployments. Solar targets and sustainable energy integration initiatives along with tax benefit, FiT and other financial leveraging provided by government will boost the PV inverter market size. The U.S. photovoltaic inverter market is anticipated to witness a gain of over 5% by 2024. Favourable regulatory measures pertaining to energy conservation and positive consumer outlook towards the deployment of sustainable energy will nourish the overall industry growth. In 2017, U.S. annual installed solar capacity accounted for 387 MW with the majority projects across Massachusetts and Minnesota. Photovoltaic inverter market across UK is set to grow subject to positive regulatory inclination towards the integration of solar technology across the nations net energy mix. The UK Government, in 2016, launched the export tariff scheme offering USD 0.06 per unit for surplus power fed back to the electric grid. Favourable government initiatives with plans to reduce carbon footprint coupled with stringent energy efficiency laws will further augment the business outlook. 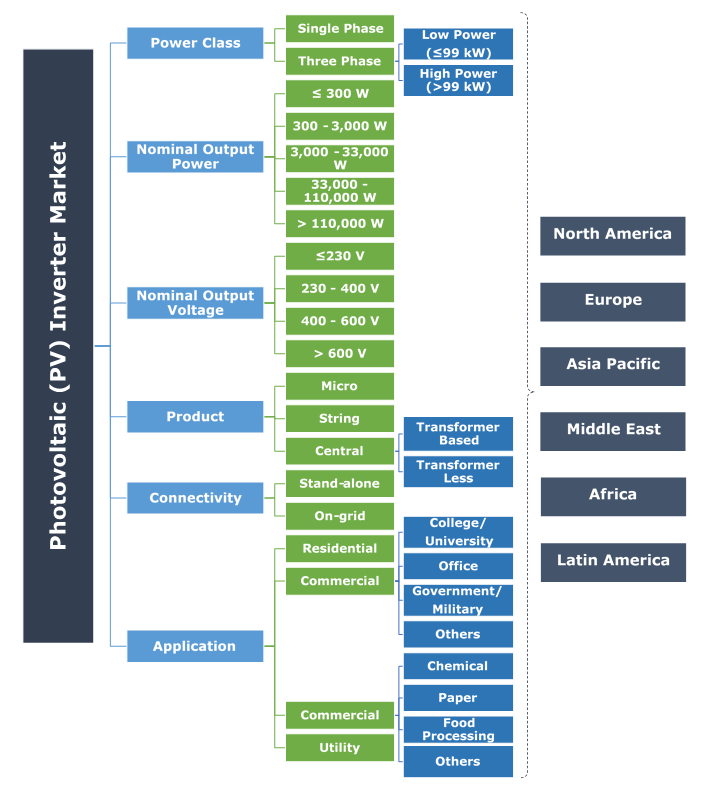 Notable Participants in the photovoltaic inverter market include SMA Solar Technology, Sungrow Power Supply Co., Ltd., Enphase Energy, Schneider Electric, Tabuchi Electric Co., Ltd., Elettronica Santerno, TMEIC, Panasonic, The Furukawa Battery Co., Ltd., Growatt New Energy Technology, Shenzhen KSTAR, REFU Elektronik GmbH, SatCon, Sineng, Solar Edge, Delta Group, TBEA, Chint Group, Fronious International, Omron, Samil Power, Emerson Electric, KACO New Energy, SolarMax, Huawei, ABB, General Electric. PV inverter is used to convert direct current into alternating current and then feeding into the grid. It offers monitoring & securing, power optimization and low loss conversion efficiency. Strict government regulation to reduce carbon emission will favour the growth of the industry during forecast period.